If a US friendly poker room climbs to number 3 in the worldwide cash game traffic rankings, despite only accepting US players, then it is time to sit up and take notice. The secret to their success has been a mix of generous bonuses and promos and their ‘recreational player model’. This model levels the playing field between amateur and pro players by restricting 3rd party tools and multi-tabling – and making all the games anonymous. 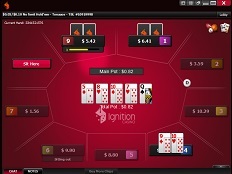 Anyone who previously played at Bovada will instantly recognize the software used at Ignition Poker. This is the same client, with the same tournament schedule, long list of cash games and super-fast Zone Poker games. There are other similarities too, including the $2 million in tournament guarantees each week, generous poker points loyalty system and satellite qualifiers to both live and online events. What is more, brand new players at Ignition Poker get $10 free – no deposit or credit card information is required – simply for signing up. Instead of sitting down and playing under your screen-name, you are simply assigned a seat number (or entrant number in tournaments). This stops 3rd party tracking software from building up stats on your play, and stops the users of those software tools spotting and exploiting all manner of minor mathematical leaks you might have. Cash games come in regular format (2, 6 and 9 handed) and the super-fast Zone Poker games. There are a lot of regular tables to choose from, with the focus being on $200 and under buy-ins. You could buy-in short for just $2 to the smallest games if you wish (2c / 5c blinds). High rollers will find the occasional games with buy-ins up to $2000. Zone Poker is a fast-fold cash game. Whenever you fold you are instantly taken to a new hand, where you are combined with other players at the same buy-in level. With no waiting around this game can be up to 4 times faster than regular cash games, and is very entertaining too. While the vast majority of the action is naturally at the No-Limit Holdem tables, you will find PLO, PLO8 and fixed limit games running too. Tournaments are a big feature at Ignition Poker, and you’ll find a long list of small and medium guarantees available around the clock. If you prefer the bigger prize games, then there is a weekly $100,000 guaranteed each Sunday, and tournament events which have even bigger games. Sit n Goes also run around the clock. There are several game and structure variations, and the standard of play is easily beatable. You can enjoy turbo (and hyper turbo) speeds, rebuys, knockout tournaments, short-handed games and Omaha tournaments too. Traffic peaks at more than 2000 cash game players in the evenings, which puts Ignition Poker way above any other US friendly poker site. This number of cash game players is enough to give ignition 3rd or 4th place worldwide. Tournament traffic is more difficult to estimate, though other sites often have multiples of 10x the number of cash game players enjoying the tournament games. You’ll find most of the play is un $25 and under cash games and $10 and under tournaments – though there is plenty enough action at the mid stakes, especially compared to other US poker sites. While this does not look as obviously up to date as some of the big international sites’ clients, you’ll find things smooth and the games easy to play. You will be able to download this software onto Windows or Mac computers. There is a smartphone and tablet compatible ‘instant play’ version of the Ignition software. This is currently restricted to just 1 table, and features both regular cash games and zone poker. 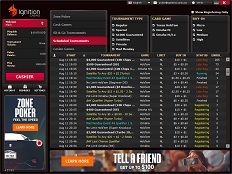 I like the navigation setup, with the 4 main formats of poker right at the top of the lobby. As you select each one you will get a full list of games. Check boxes appear to the right of the poker type choice, which allow you to narrow the list of tables. For example, by buy-in, table size or tournament format / structure. You simply double click on a table to open it, and will immediately see any empty seats. I like the way a spotlight follows the action around, though would prefer if the timer for each action was a little quicker at times! Ignition Casino has a certification from the reputable iGaming Labs in the footer of their website. This shows that their random number generator, which controls the deal of cards, has been thoroughly tested and declared fair. Ignition are owned by a company called Lynton Ltd, and are fully licensed by the Kahnawake Gaming Commission. The sign-up process literally takes 1 minute. You’ll need to supply some basic information, set a password and then click the ‘register’ button. New players will see their $10 in bonus cash credited right away, and the next step will take you to the deposit screen where you can deposit and claim your 100% welcome bonus. Your main choices for funding your Ignition Poker account is between credit cards and Bitcoin. All of the main brands of Credit Card are accepted here, with Amex, Visa and MasterCard all on the list. Note that the financial gateways do still try and block credit card transactions, so expect this to be tagged as a foreign cash purchase. Ignition support will be happy to help out if there are any issues, and can even advise on pre-paid Visa cards if your own card gets declined. Bitcoin is now moving into the mainstream and you do not need to be technical to set up a wallet and move money around using this new virtual currency. This has the advantage of being out of the hands of the financial authorities. Those all-important withdrawals are carried out via a paper check – with one withdrawal per month incurring no charges. If you deposited with Bitcoin, you can also use this system for withdrawals.